Devin Rasco was born in Texas, moved to Hawaii shortly after birth until age 4, then returned to Texas, where he was raised until graduating from Plano Senior High School in 2012. After graduation, he returned to Hawai‘i with his parents. He now attends Honolulu Community College, where he is enrolled in the Computing, Electronics, and Networking Technology (CENT) and Information Assurance programs. He plans to continue his studies at UH West Oahu to complete dual bachelor’s degrees: Bachelor of Applied Science in Computing, Electronics and Networking Technology (CENT) and Bachelor of Applied Science in Information Security and Assurance (ISSA). After graduation, Devin plans to explore his options for jobs and graduate school. 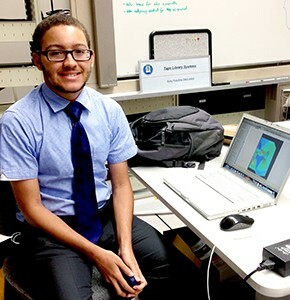 His favorite pastimes include art, gaming, and further exploration of IT-related topics, such as creating games, designing websites, and building computers. Project Abstract: Wireless maps are used to determine the strength of signals coming from various wireless access points around a building or other facility. These wireless maps also allow IT managers to see regions that have no connectivity or poor connectivity compared to other areas within in the same facility. These maps can be used to deploy new access points without disrupting the rest of the network with connection loss. When deployed correctly, the company or facility can benefit from better connections on their network and make plans for any sort of expansion to their facility. First, we created a wireless map for the Subaru Telescope Base Facility, then determined the best arrangement of access points to limit the range of their open-network signals to be within the boundaries of their facility. Second, we investigated ways to optimize the security protocol for the internal network at the Base Facility. We began the process of switching every staff member at Subaru over to a new network that uses WPA2-enterprise for its security protocol instead of WPA2-personal. After this transition is complete, the facility will have a backup network as well, in the event that the active network is breached. Three extensive documents were created as part of the output of this project, analyzing various factors of the wireless coverage of the Base Facility.